Reserve a comfortable and affordable guest room close to Nut Tree Airport, local businesses and attractions. We offer a variety of valuable amenities for your stay. Surf the web and stay connected with complimentary high-speed Internet, or watch your favorite shows on premium cable TV. 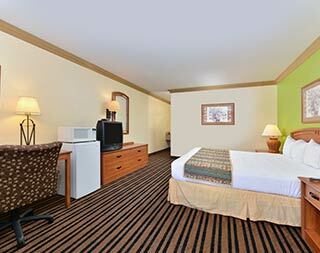 All rooms come with a work desk, mini-fridge, and microwave to help you feel right at home. Our Vacaville, California motel accommodations offer an unbeatable value for leisure or business trips. This guest room is ideal for business travel, California getaways or stopover trips halfway between San Francisco and Sacramento. It comes equipped with complimentary Wi-Fi, a work station, microwave, and mini-fridge. 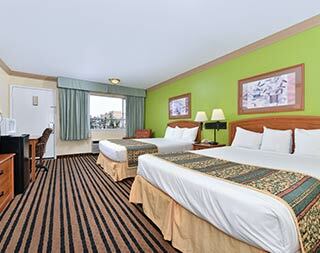 Featuring two comfortable beds, this room is ideal for family, friends or group travel. Enjoy the comforts of home such as a microwave, sitting chair and mini-fridge. The room also comes with complimentary Internet service.